There were emotional scenes at the Sama-Sama hotel at Kuala Lumpur’s international airport today when relatives of Chinese passengers on board the missing flight MH370 came to the hotel where the press conferences are held and protested about Malaysia’s handling of the plane’s disappearance. The relatives, one of whom has a son on the missing plane, were extremely distressed. They unfurled a banner and attempted to talk to journalists, but were dragged away kicking and screaming by police. They are demanding clearer information from the Malaysian authorities. Relatives have not been staying at the Sama-Sama; they have been kept well away from the media at another hotel in the suburbs of Kuala Lumpur. The authorities said they regretted today’s scenes. One can only imagine the anguish relatives are going through, acting transport minister, Hishammudin Hussein, tweeted this evening. “Malaysia is doing everything in its power to find MH370, and hopefully bring some degree of closure for those whose family members are missing,” he said. The minister said he had ordered an immediate inquiry into this afternoon’s events. At today’s press briefing, 12 days after the plane’s disappearance, Mr Hishammudin dismissed suggestions that it had been sighted in the Maldives on the morning of its disappearance 12 days ago. He said the chief of Malaysia’s defence force had contacted his counterpart in the Maldives, who said the reports were not true. Residents of the remote Maldives island of Kuda Huvadhoo are reported to have sighted a low-flying jumbo jet at about 6.15 a.m. local time on March 8. They are quoted as saying it was a white aircraft, with red stripes across it – an accurate description of a Malaysia Airlines flight. This reported sighting has been linked in with speculation that has been prevalent on social media that the plane was diverted to the Diego Garcia atoll in the central Indian ocean, a British territory where there is a US base. Mr Hishammudin appealed today for people to refrain from speculation that would make a difficult time any harder. The passengers, pilots, and crew were all innocent until proven otherwise, he said. Today, Malaysia’s inspector-general of police, Khalid Abu Bakar, said that the data log of games on the flight simulator found in the home of the chief pilot, Captain Zaharie Ahmad Shah, was cleared on February 3. Experts are trying to retrieve the data. There has been a flood of comments from Captain Zaharie’s friends, who say they do not believe he could have hijacked the plane, and there is no actual evidence that either of the two pilots are responsible for the disappearance of flight MH370. The police chief would not comment any further about the ongoing investigation, saying only that the same four avenues were being explored. These are a possible hijacking or sabotage, and investigations into whether any of the passenger or crew members had psychological or personal problems. The transport minister said passenger background information had been received from all countries except Ukraine and Russia, both of which had nationals on the plane, and no information of any significance had been found. Mr Hishammudin also said that a high-level team was being sent to Beijing to update next-of-kin and explain what Malaysia is doing to try and find the missing plane. He said he fully understood what families were going through, and emotions were of course high. The Malaysian authorities, he said, were discussing with the French delegation now in Kuala Lumpur how to handle these emotions and appease the families. An Air France flight went down in the Atlantic in 2009 and it took two years to find the black box. Mr Hishammudin said the authorities understood relatives’ concerns and were doing their very best. It was all heart-wrenching, even for him, he said. Yesterday, Mr Hishammudin said the area of land and sea being covered in the search measured more than 2.24 million square nautical miles – an area the size of Australia. Twenty five countries are now assisting Malaysia. He said again today that the priority was to narrow the search corridors. This was being done, he said, by gathering satellite information, analysing radar data, increasing air and surface assets, and increasing the number of technical experts involved in the search. Today there were search aircraft in Kuala Lumpur, ready to go, but having to wait for permission from other countries to enter their air space. China, meanwhile, sent a fleet of nine ships to scour the Bay of Bengal and the seas west of Indonesia. The Thai air force now says its radar tracked a plane that may have been flight MH370, but it says it still needs to analyse this data. An airforce spokesman has been quoted as saying the information was not released earlier because the plane never entered Thai airspace and Malaysia’s initial request for information was not specific. 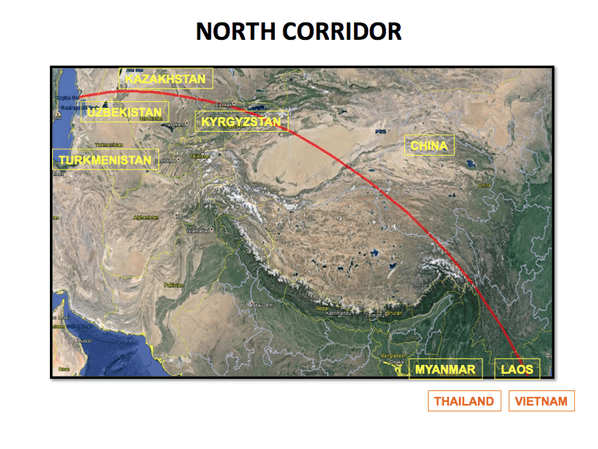 It’s believed the Thai radar reading shows that the plane did turn west, off course from its scheduled route to Beijing. 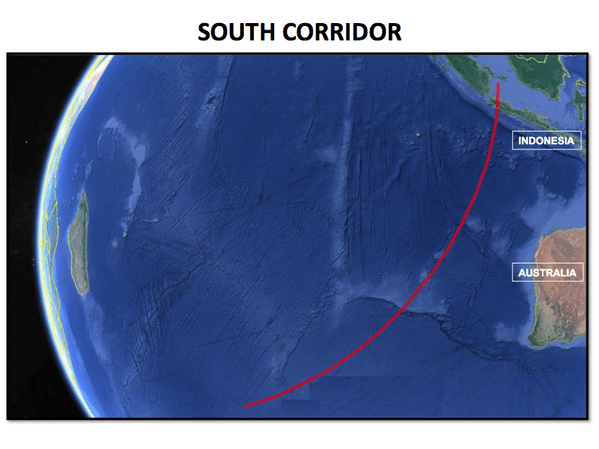 This is information that would have supported indications from Malaysian military radar. It is believed that the plane did turn around and then fly on for about seven hours after contact with air traffic control was lost. 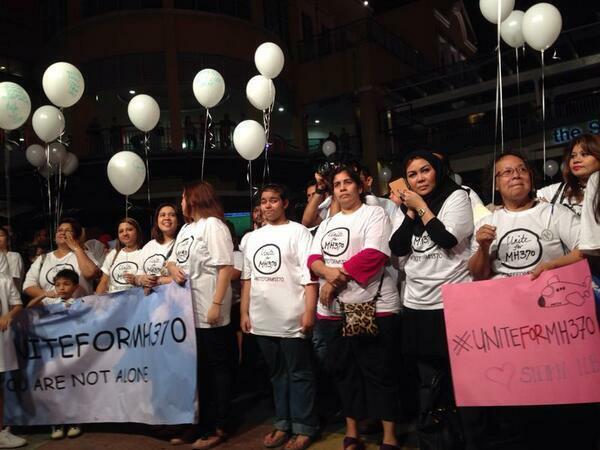 Last night, hundreds of people thronged to a “Unite for MH370” event at the piazza of the Curve shopping centre in the Kuala Lumpur suburb of Petaling Jaya. The gathering was described as “an evening of solidarity, hope and prayer”. Singer-songwriter Reshmonu, who helped organise the event, said he hoped the public would stop speculating and, instead, show their concern for those affected. In Beijing, meanwhile, distressed relatives of those on board the missing plane have been threatening to go on hunger strike in protest at Malaysia’s handling of the situation.